www.deSIGNerySigns.com designs and manufactures all types of signs such as magnetic signs, custom vinyl banners, custom decals and stickers. www.dimensionalletters.com Check out this site for quality 3 dimensional letters, building letters, wall lettering and three dimensional letters and graphics. www.Labels-USA.com A great site for all of your companies labeling needs. Products include barcode labels, embossed labels, roll labels and shipping labels. 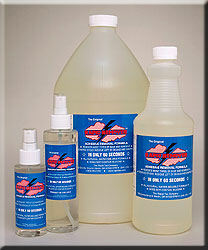 This environmentally friendly product is great for removing adhesive glue left over by decals and vinyl graphics. Rapid Remover is a non-toxic, water-soluble that breaks down and removes adhesives in sixty seconds! You spray it on, wait thirty to sixty seconds, and easily wipe it off with a plastic squeegee, with no damage to painted or bare metal surfaces. What may have been a four-hour job (and a messy one at that) can now be done in one and half-hours: an easy, clean and non-damaging removal. Your shop or business will benefit greatly from these products; think of them as tools. Get the right tool for the job! STEP 1. Remove decal with heat lamp or heat gun. STEP 2. Spray glue residue with Rapid Remover and let penetrate for 30-60 seconds. STEP 3. Using a squeegee, scrape to remove glue residue. STEP 4. Spray Rapid Remover on a paper towel and wipe surface clean. STEP 5. Rinse surface with Rapid Remover Application fluid or water. Product is water-soluble. Original Purpose: Key tuna-salad ingredient. Aha! Use: Adhesive remover that banishes old stickers from mirrors, glass, and bumpers. Apply a generous helping to persistent adhesives and coax off with a flexible putty knife. Reward: Unstick sticky surfaces without the noxious fumes of the commercial stuff. Tired of that bumper sticker on the rear bumper of your car or truck? Automotive expert Trisha Hessinger tells you the best way to remove a sticker without damaging your paint or chrome. Begin by softening the sticker's adhesive using a hair-dryer. After the adhesive has begun to soften, spray a light spray-lubricant over the surface of the sticker. After the lubricant has soaked in for a few minutes, you should be able to begin peeling back the sticker (figure A). Peel slowly and carefully. If you have to do any scraping to remove adhesive or sticker residue, use a plastic spatula or similar tool. Avoid using any sort of metal scraper or blade as this could scratch damage the paint or the bumper. If any adhesive remains after the sticker has been removed, follow up by wiping the area well with ordinary rubbing alcohol and a clean cloth to help dissolve and remove the adhesive. One of the chief obstacles to a finishing touch for an installation is the easy-peel sticker - the list features plastered to the oven door, or the cleaning instructions on the light fixture lens. Often the paper comes off, leaving rubbery adhesive behind, looking terrible. To save customer aggravation, firmly press a piece of duct tape onto the stickum, and peel it off. The adhesive usually comes off with the duct tape, leaving a spotless installation. Q When I removed a large sticker from my new refrigerator, a lot of the adhesive remained. It's very sticky, and I can't get it off. Do you have any suggestions? A Before using anything on the surface of your refrigerator, read the manufacturer's instructions and warranty, or visit the company's Website. Chemicals in nail-polish remover, cleansers and ammonia could scratch or discolor the surface, and the warranty may not cover this kind of damage. Instead, use baby oil or mineral oil, a petroleum-based prewash spray or a lubricating spray. With a soft cloth, apply just enough solution to saturate the sticky area. Let it soak in, then gently rub with a plastic scrubbie to remove the residue. Is that sticky residue from an adhesive label resisting all your efforts for removal? Let WD-40 do the work for you. 1. Spray WD-40 directly on the residue if possible, or dab on with a cloth. 2. Let sit for about 5 to 10 minutes, or until softened. 3. Wipe off with a cloth. 4. If some residue remains, repeat. 5. Clean with a damp cloth; buff dry. For other recommended commercial and non commercial adhesive removers try searching google for "adhesive removers" below. © Copyright 1995 - 2019 Vinyl Graphics & Lettering, a deSIGNery Co - All rights reserved.